All ST Imaging authorized dealers provide local sales, service, and support in addition to the manufacturer’s warranty on ST Imaging microfilm scanners. Installation and on-site service will be provided in the authorized dealers service plans. 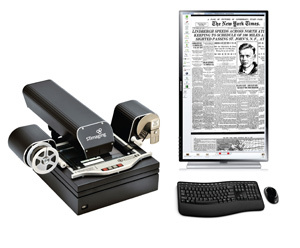 That should also include repair, user training, parts and accessories of the microfilm scanner. Go to our Authorized Dealer Network section to find our exclusive dealer for your area. Customers are encouraged to first contact their authorized dealer who installed the system with questions about their microfilm scanner. Technical support for hardware and software is available, as well as repair services, through the manufacturer for a fee. See the Support Contacts section to contact ST Imaging for all repair, parts and warranty service. You will need to use a Return Material Authorization (RMA) form to send a unit in for repair. Contact ST Imaging at 847-501-3344 and a customer service representative will email or fax an RMA form to you. All ST Imaging digital microfilm scanners and software products are warranted in the US for three years from the date of purchase. Technical support and repair is available through the manufacturer. Equipment can be sent to the depot service location for repair or replacement. Customer pays shipping. A Return Material Authorization form must be submitted and authorized before shipping any products. For more information on the manufacturer’s warranty, review the information in your owner’s manual, view our terms and conditions online or contact ST Imaging at info@stimaging.com.